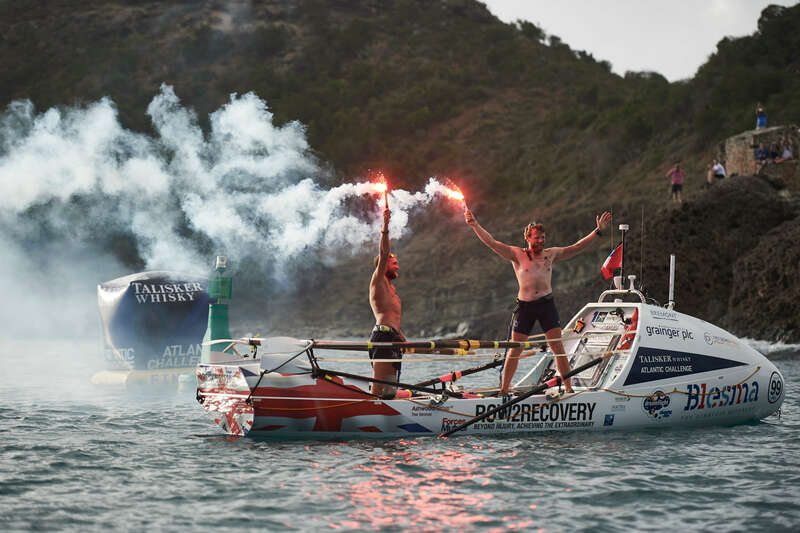 Between 14 Dec 17 and 20 Jan 18, Capt Jon Armstrong RGR and military amputee LCpl Jordan Beecher PARA rowed 2,550 nautical miles across the Atlantic Ocean as Row2Recovery. 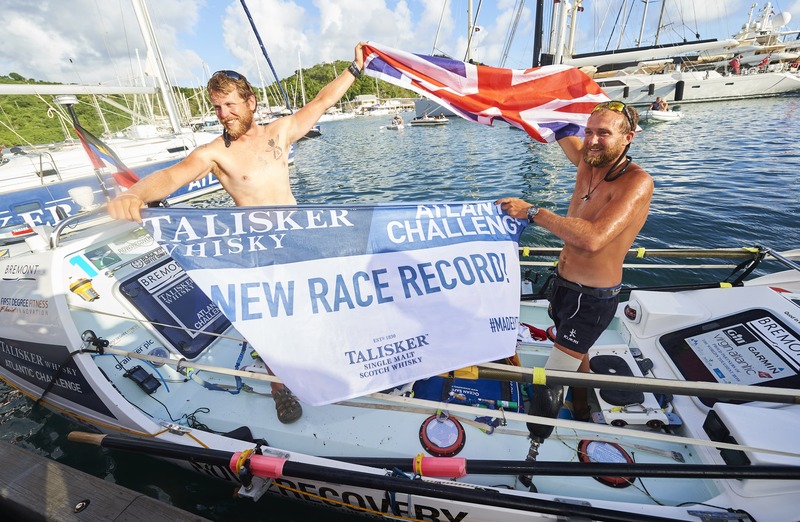 The pair endured storms, physical and mental hardship and capsizing to set a new World Record for the fastest pairs crossing of the Atlantic in a time of 37 days, 8 hours and 8 minutes. Jordan and I met in 2007, whilst preparing to deploy to Afghanistan with The Parachute Regiment. On my first day in C Company, Jordan, as one of the senior Toms, took me under his wing and, despite him cheating at a game of rockman and getting me three-man lifted, we quickly bonded over a shared love of questionable dance music and having been born in the same town in rural Hertfordshire. Having completed our six month tour, our company returned to the UK where I went back to university and Jordan continued with his career in The Parachute Regiment. One of the fittest and most professional soldiers in the company, Jordan was the model paratrooper. He came top of his PJNCO cadre and had aspirations to join UKSF or to commission as an officer. However, those dreams would not be realised as, tragically, Jordan’s military career was cut short in 2012, when he lost his left leg to an IED whilst conducting operations in Helmand Province, Afghanistan. Despite the life changing nature of his injuries, the support and care that Jordan received at both Queen Elizabeth Hospital and Hedley Court was second to none and he not only managed to maintain a positive perspective on life but remained committed to meeting life’s challenges head-on. As part of his rehabilitation, Jordan began to row and from the outset his natural aptitude for the sport was clear. After a very short time, Jordan was selected to join the Team GB Paralympic squad where he competed both at home and abroad with great success. He also competed twice at the Invictus Games, where he won four gold medals, and at the Henley Regatta, where he was the first disabled rower to compete in an able bodied boat. In 2016, as Jordan’s sporting career was drawing to a close and he began his transition into civilian employment, he invited me for breakfast in Henley one Saturday and asked me to row the Atlantic with him as Row2Recovery in the Talisker Whiskey Atlantic challenge. I agreed, but only after making it clear to him that I had never sat in a rowing boat before. This didn’t seem to bother him at the time, although I am sure he regretted it more than once since, and we embarked on the long road to the start line together. As with any great endeavour, the hardest part is raising the funds to get to the start line and Jordan and I are incredibly grateful to those who contributed, including the Ulysses Trust. Almost all our energies went into fundraising and, when combined with busy work and family commitments, left very little time for technical training. This became apparent when we arrived at the start line in La Gomera, Spain, and our competitors looked both fitter and more competent when practicing out on the water. However, what Jordan and I did have was the army mentality to what we saw as a military operation. We began by stripping all excess weight off our boat and removing all personal comforts. In the end this meant that our boat was much lighter than the rest of the fleet and it sat much higher in the water, which meant less friction. We also planned our routines and divided tasks which meant that out on the water we would be slicker and more efficient. However, most importantly we didn’t place ourselves under undue pressure. We wanted to win, but not at any cost, and we agreed that the race was not worth a friendship that had been ten years in the making. On 14 Dec 17, the race finally began and Jordan and I headed out onto the Atlantic Ocean. 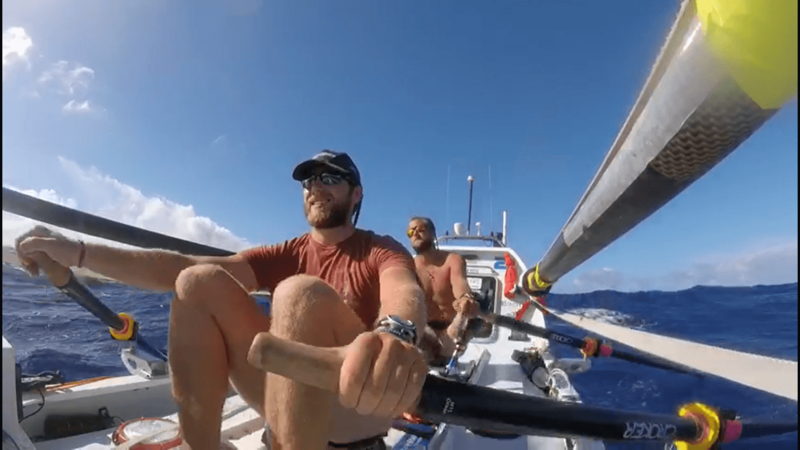 The perceived wisdom amongst ocean rowers is that you should row naked so that the friction of clothing mixed with the salt of the sea doesn’t cut into your skin. Jordan and I adopted this approach about forty-five minutes into the race and spent the next month together naked. The weather was poor as we left La Gomera, with strong winds blowing off the coast of Africa creating storms and high seas with five meter waves. The first two weeks of the race were therefore very tough and the time where we should have been settling into a routine was spent trying to keep the boat from turning over and trying to vaguely go in the right direction. We counted ourselves lucky as our boat only capsized once during the whole trip and although I wouldn’t want to repeat the experience, the boat immediately came back up which gave us confidence in our equipment and our own drills. Other teams were not as lucky and our biggest competitors spent twelve hours in the water waiting for rescue because their boat failed to self-right. As previous competitors advised us, we initially adopted a two hour shift rotation which meant that one rested whilst the other rowed. 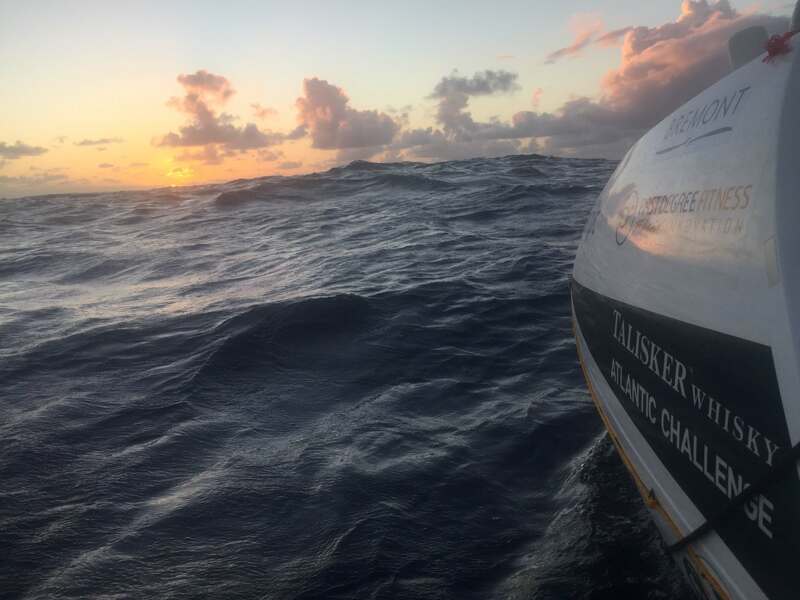 We found this system worked well but as we had limited experience of ocean rowing we found that our competitors were able to use the weather much more effectively than us and we started to lose our lead. We were therefore needed to adopt our tactics and started to employ a three hour rotation with one hour off, one hour rowing with the other person and then one hour rowing alone. After three weeks at sea our bodies inevitably started to degrade and our backsides took the brunt of the damage as the salt got under the skin. Spots turned to cuts and boils, which in turn then started to get infected, and soon we were digging into our supplies of antibiotics and painkillers as we tried to dull the pain and get what little relief they offered. 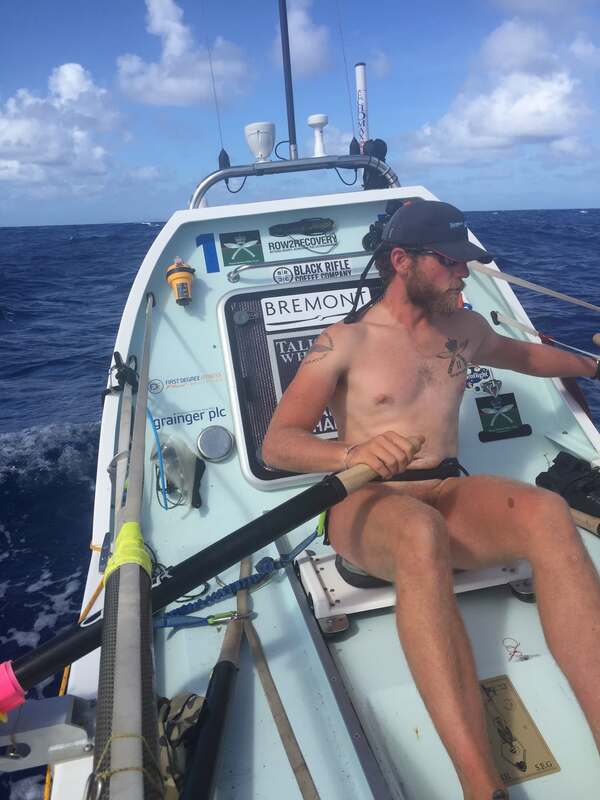 The physical degradation was the worst part of the row but there were many highs and we were privileged to experience the Atlantic at its best and worst. 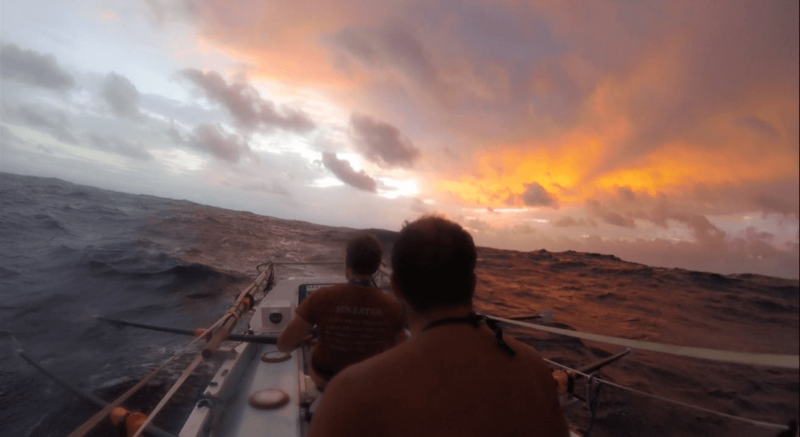 One of the most memorable moments was having a pod of dolphins join us as we entered the final third of the race. I will never forget the dolphins playing in the waves as they came to within touching distance of our boat. On the morning of day 37 we finally sighted Antigua and were immediately struck by how vividly green it was. We also started to see life in the form of small fishing boats which prompted us to once again don clothing, the first time in over a month! Rowing into English Harbour was an experience I doubt that we will ever forget. The superyachts in the harbour sounded their horns, people waved from the hills surrounding and many small boats motored around congratulating our arrival. When we arrived at the pier, the champagne was popped and went straight into our eyes, which may account for why in the pictures we look as if we were crying. The crowds gathered and even a section of Antiguan Defence Force personnel had turned up to welcome us in. As we took our first steps onto dry land our legs gave way and we struggled to stand still enough to give interviews and talk to our families. The sheer scale of the Atlantic Ocean, along with its capacity for violence and volatility is truly humbling. Both Jordan and I now know that nobody conquers an ocean, people can only dare to dream and if they have prepared and are lucky, then the ocean will allow them a brief window of opportunity to make a crossing. Whilst on the Atlantic the conditions pushed us both to our physical and mental limits and we came to rely on each other for comradeship, companionship and survival. We now move forward knowing more about ourselves and each other than we ever thought possible and I am proud to say that we remain the very best of friends.